He was interviewed as part of an investigation into alleged sexual abuse by Dr. Richard Strauss decades ago. Rep. Jim Jordan of Ohio met with investigators on Monday as part of Ohio State University's ongoing investigation into accusations that a wrestling team doctor sexually abused athletes more than 20 years ago. Jordan, now a powerful House Republican, was an assistant wrestling coach at the university at the time, and questions have emerged recently about whether he knew of the alleged abuse when it was happening. “He told the investigators what he’s told the media from the start. He never knew of any abuse, and no abuse was ever reported to him,” Ian Fury, a spokesperson for Jordan, told NBC News. In April, Ohio State announced that it had opened the investigation into alleged misconduct by Dr. Richard Strauss, who died by suicide in 2005. Ohio State says the investigation has uncovered reports of Strauss’ sexual misconduct from former male student-athletes across 14 sports, as well as from former patients of the university’s student clinic. Former wrestlers for Ohio State were the first to come forward with accusations against Strauss, who worked as the team doctor from 1978 to 1995. Ten former wrestlers, some of them Jordan supporters, have told NBC News and other media outlets that Strauss performed medically unnecessary examinations where they were fondled and groped. On Tuesday, five former student wrestlers filed a pair of federal class-action lawsuits against the university in Ohio’s Southern District, claiming coaches and administrators knew about Strauss’s record of abuse and didn’t do enough to stop it. One lawsuit mentioned Jordan, citing NBC News reports from former wrestlers alleging that Jordan "was also aware of Strauss’ abuse but that he also concealed it,” according to the complaint. Jordan was not listed as a defendant in the suit, which named only Ohio State. The school said in a statement that it "remains committed to uncovering what may have happened and what university leaders at the time may have known." Six former wrestlers have spoken to NBC News, alleging Jordan turned a blind eye to the abuse by Strauss. One former wrestler, Dunyasha Yetts, said he had reported the abuse directly to Jordan, an account corroborated by a second wrestler, Shawn Dailey. Other wrestlers who spoke to NBC News said they believed Jordan must have known of the abuse because Strauss' inappropriate behavior, which ranged from groping during appointments to long showers with the team, was regularly discussed in the locker room. 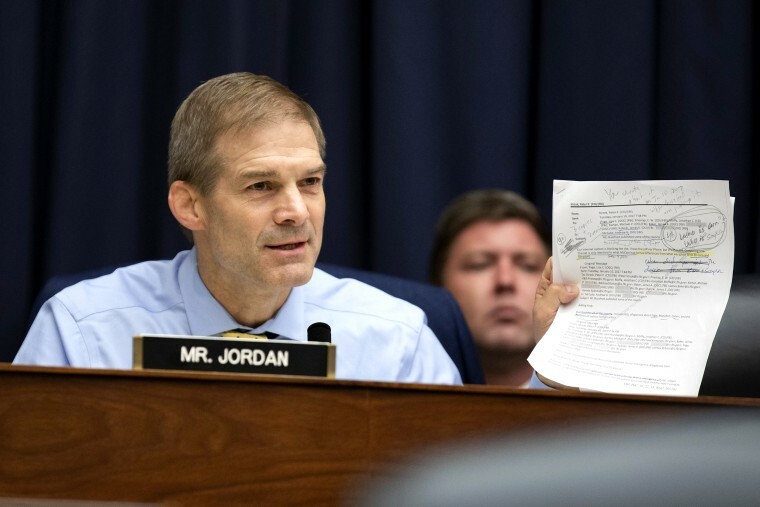 As reported by The Washington Post, Jordan appeared on an Ohio radio program Wednesday morning where he spoke about the interview with investigators and denounced those who have criticized his denials.